The latest touring production of the ’80s übermusical retains its rousing sentiment. Do you hear the people sing? They’ve been singing for well over 25 years now, slowly marching downstage while a red flag waves behind them, signaling the start of revolution on the streets of Paris. No matter how many times you’ve heard Claude-Michel Schönberg’s rousing score or seen one of this show’s regular touring productions, there’s no denying the power of that moment. 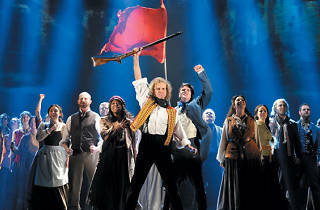 The final staging of Les Misérables to come through Chicago before the film adaptation hits theaters this Christmas, Laurence Connor and James Powell’s production makes a solid argument for catching the musical live. With the aid of projections designed by Fifty Nine Productions, the directors create a show that’s as eye-popping as it is well sung. Unfortunately, rushed tempos prevent some songs from fully blossoming. The added speed robs key moments, like the start of the iconic “I Dreamed a Dream,” of their emotional impact. The rich tenor voice and petite frame of Peter Lockyer, as criminal-turned-mayor Jean Valjean, contrast beautifully with the booming baritone and hulking presence of Andrew Varela’s Javert. Chicago favorite Max Quinlan charms as young student Marius, while Briana Carlson-Goodman’s powerful Éponine will make audiences wish Marius chose his lovers differently. 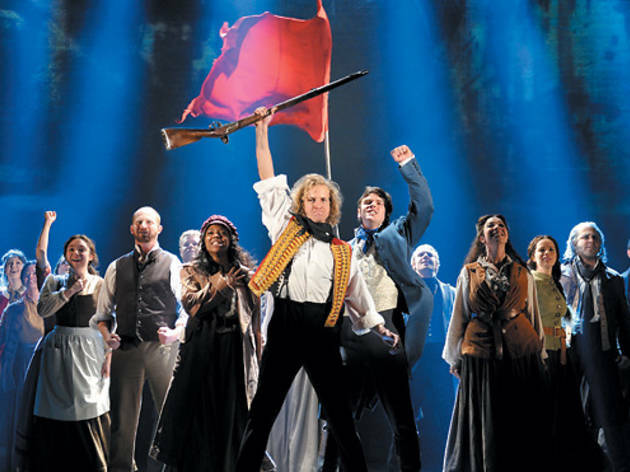 As the performers make the epic story of the French Revolution personal and relatable, it’s clear why these characters continue to captivate with their songs.